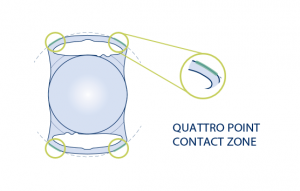 The innovative XL optic of the ASPIRA-aXA combines the advantages of a 7.0 mm optic with the stability of the innovative cut-out haptic design, conveniently provided in the preloaded SAFELOADER® implantation system. Convenient, astigmatism-neutral implantation through small incisions. Intuitive. Simple. Fast. ASPIRA-aXA provides a tailor-made solution for a diverse range of needs. Possible applications range from standard cataract and refractive surgeries to combined retinal surgery interventions. Due to its XL 7.0 mm optic, this posterior chamber lens supplies the best conditions for long-term pseudophakic reliability for the patient. 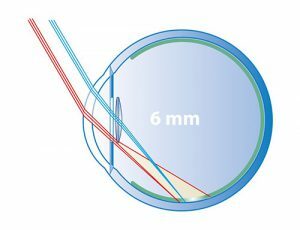 The extended fundus view, which is enabled by the possibility of a rhexis diameter of up to 6.5 mm, represents an enormous contribution to preventive patient management and early detection of ocular diseases. Risk factors such as diabetes or hypertension are continuously increasing in our population. Especially for this group within the cataract patients, the ASPIRA-aXA lays the foundations for long-term pseudophakic reliability. Intraoperative image (using Verion) with implanted ASPIRA-aXA. Edge of the XL optic (black). Rhexis, diameter 6.0 mm (blue). From a vitreoretinal point of view, both the surgeon and the postoperative doctor benefit from the extended fundus view. The assessment of the posterior segment of the eye and the implementation of therapeutic measures for peripheral retinal diseases can occur more conveniently. ASPIRA-aXA offers patients with an increased risk of ocular diseases an advantage for long-term, successful pseudophakic treatment. The ASPIRA-aXA is also an ideal treatment option for patients with large pupils. In these patients, the mesopic pupil width often exceeds the diameter of the IOL optic. Off-axis rays are scattered on the edge of the optic or pass the IOL and strike the retina as stray light. The result can be an increased incidence of dysphotopsia. With a conventional 6.0 mm optic, the patient could be affected by edge effects or other light phenomena. The ASPIRA-aXA with its XL optic is an ideal treatment option for large pupils. Simulated beam guidance (temporal), based on a simulation using Zemax, OpticStudio 16.5 with a 6 mm optic and a 7 mm optic; pupil size 4 mm each. HumanOptics AG (2017). Invitro-Simulation, Data on file. When force is applied, the cut-out haptics prove to be stable elements for positioning the IOL.